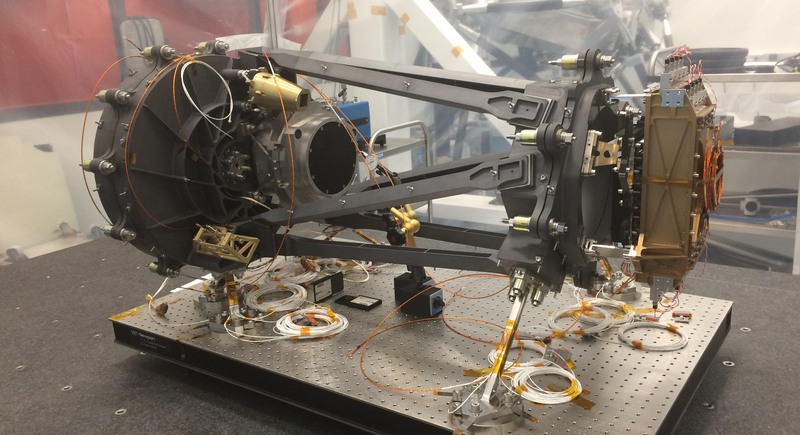 <h2>Space telescope to test Einstein’s theories about gravity </h2><br /><p>The Euclid mission, which is due to be launched by the European Space Agency in 2021, will capture images of billions of distant galaxies to provide new insights into how gravity works in the depths of space.</p> <p>Einstein’s famous theory, which he published in 1915, is widely considered to be the best way of explaining gravity. It essentially says that massive objects cause the fabric of space and time to curve, which causes other objects to fall towards them.</p> <p>But while general relativity appears to be consistent with how scientists observe gravity behaving in our own solar system and galaxy, it begins to look less convincing on larger scales.</p> <p><a href="https://www.nobelprize.org/prizes/physics/2011/press-release/" target="_blank" rel="noopener noreferrer">Observations of distant supernovae</a> suggest that our universe is accelerating as it expands, although <a href="https://horizon-magazine.eu/article/dark-energy-biggest-mystery-cosmology-it-may-not-exist-all-leading-physicist_en.html" target="_blank" rel="noopener noreferrer">some scientists dispute this</a>. For accelerated expansion to happen under general relativity requires the universe to be permeated by a mysterious, and so far undiscovered, ‘dark energy’ that is needed to drive the process.</p> <p> <div class="quote-view quotesBlock quote_horizontal"> <div class="quotesTop"><img src="https://horizon-magazine.eu/sites/all/themes/horizon/images/quotes_top.png" alt="" title="" /></div> <p>‘If general relativity is modified, we may not need dark energy at all to explain what is going on.’</p> <blockquote><p>Professor Kazuya Koyama, University of Portsmouth, UK.</p></blockquote> <div class="quotesBottom"><img src="https://horizon-magazine.eu/sites/all/themes/horizon/images/quotes_bottom.png" alt="" title="" /></div> </div> </p> <p>While many physicists are convinced by the existence of dark energy, others are searching for alternative explanations.</p> <p>‘General relativity is a very good theory to describe gravity,’ said Professor Kazuya Koyama, a cosmologist at the University of Portsmouth in the UK. ‘But when we apply it on a large, cosmological scale, we see some very strange things that we need dark energy to explain. The problem is that we have no idea what dark energy is.</p> <p>‘If general relativity is modified, we may not need dark energy at all to explain what is going on.’</p> <p>Prof. Koyama leads a project called CosTesGrav, which is using observations of distant galaxies to help develop new theories that modify general relativity so it works on large scales. The data gathered by Euclid when it launches will be vital to help them do this.</p> <p><strong>20 sextillion miles</strong></p> <p>The CosTesGrav researchers are using observations of galaxies that are up to 3.3 billion light years (20 sextillion miles) away to look for tiny distortions in their shape caused by gravity.</p> <p>The general theory of relativity states that light is bent by gravity, meaning that it can leave a distinctive signature in the light emitted by distant astronomical objects like galaxies.</p> <p>The CosTesGrav team have already used images from the Hubble Space Telescope to look for some of these distortions and <a href="http://science.sciencemag.org/content/360/6395/1342" target="_blank" rel="noopener noreferrer">found that the signature left by gravity</a> is consistent with general relativity.&nbsp;</p> <p>But Prof. Koyama believes that larger-scale surveys like those conducted by Euclid could allow them to detect distortions that indicate there may be something else at work.</p> <p>‘We need to explain the success of general relativity on small scales but at the same time modify it over very large scales,’ said Prof. Koyama. ‘It is a challenge. We have two approaches – one is to come up with theoretical models and use state-of-the art simulations to test them.</p> <p>‘The other is to use the observations and look for the signatures of a deviation from general relativity.’</p> <p>He says that combining these approaches will enable the researchers to capitalise on Euclid’s highly accurate maps of the distribution of galaxies and test general relativity on a cosmological scale.</p> <p>Their work could not only solve one of the biggest outstanding puzzles about the universe, but could also radically rewrite our understanding of our place within it.</p> <p><strong>Extra dimensions</strong></p> <p>One leading alternative theory to dark energy suggests that space-time may have extra dimensions that are only possible to detect on the cosmological scale.</p> <p>‘This is exciting as we might find something very different from the usual notion of space-time on very large scales,’ said Prof. Koyama. ‘But at the moment our current understanding of general relativity is safe.’</p> <p>A modification to general relativity, however, could have important implications here on Earth. Most of us use the theory every day when we follow directions on our mobile phones or in-car navigation systems.</p> <p>‘The accuracy of GPS (the global positioning system) is amazing but that is only possible due to adjustments using general relativity,’ explained Prof Koyama. ‘We don’t know how important any discoveries we will make in the future will be for future technological development.’</p> <p>The data gathered by Euclid will also prove vital for scientists working on another project that is looking to not only test the general theory of relativity, but also shed light on some of the initial conditions that led to the current structure of the universe.</p> <p>The GrInflaGal project is using observations of massive galaxy clusters – vast, dense structures bound together by gravity in space formed of millions of galaxies – to examine the distribution of matter in the universe and the effects of gravity.</p> <p>‘We want to model galaxy clustering on large scales, but to do this we need to know how these galaxies behave,’ said Dr Fabian Schmidt, a cosmologist at the Max Planck Institute for Astrophysics in Garching, Germany, who is leading the GrInflaGal project.</p> <p>By measuring how other objects around galaxy clusters behave – such as looking at differences in speed compared to their mass – the researchers believe they can measure the gravity of these enormous structures and so test whether they adhere to general relativity.</p> <p><strong>Clump</strong></p> <p>This could then be used to help unravel how the universe went from being a hot, uniform clump of dense matter to one where galaxies are scattered in clusters seen today.</p> <p>‘The goal is to have a nearly optimal way of testing gravity from upcoming surveys like Euclid,’ said Dr Schmidt. ‘We have no idea about how inflation in the early universe happened, but surveys like Euclid could improve the constraints we are using.</p> <p>‘Gravity is such a fundamental part of our physical understanding of the universe, and cosmology is giving us the chance to probe it on a much larger scale than ever before.’</p> <p><em>The research in this article was funded by the EU. If you liked this article, please consider sharing it on social media.</em></p> <p>&nbsp;<a href="http://bit.ly/newsalertsignup" target="_blank" rel="noopener noreferrer"><img src="https://horizon-media.s3-eu-west-1.amazonaws.com/s3fs-public/IMCEUpload/news-alert-final.jpg" alt="" width="983" height="222" /></a></p> <br /> <img src=”http://www.google-analytics.com/collect?v=1&tid=UA-40077089-1&cid=space-telescope-to-test-einstein’s-theories-about-gravity-&t=event&ec=republish&ea=read&el=space-telescope-to-test-einstein’s-theories-about-gravity-&cs=republish&cm=republish&cn=republish&cm1=1" /> This post <a href="https://horizon-magazine.eu/article/space-telescope-test-einstein-s-theories-about-gravity.html">Space telescope to test Einstein’s theories about gravity </a> was originally published on <a href="https://horizon-magazine.eu/">Horizon: the EU Research &amp; Innovation magazine | European Commission</a>. The Euclid mission, which is due to be launched by the European Space Agency in 2021, will capture images of billions of distant galaxies to provide new insights into how gravity works in the depths of space. Einstein’s famous theory, which he published in 1915, is widely considered to be the best way of explaining gravity. It essentially says that massive objects cause the fabric of space and time to curve, which causes other objects to fall towards them. But while general relativity appears to be consistent with how scientists observe gravity behaving in our own solar system and galaxy, it begins to look less convincing on larger scales. Observations of distant supernovae suggest that our universe is accelerating as it expands, although some scientists dispute this. For accelerated expansion to happen under general relativity requires the universe to be permeated by a mysterious, and so far undiscovered, ‘dark energy’ that is needed to drive the process. Professor Kazuya Koyama, University of Portsmouth, UK. While many physicists are convinced by the existence of dark energy, others are searching for alternative explanations. ‘General relativity is a very good theory to describe gravity,’ said Professor Kazuya Koyama, a cosmologist at the University of Portsmouth in the UK. ‘But when we apply it on a large, cosmological scale, we see some very strange things that we need dark energy to explain. The problem is that we have no idea what dark energy is. Prof. Koyama leads a project called CosTesGrav, which is using observations of distant galaxies to help develop new theories that modify general relativity so it works on large scales. The data gathered by Euclid when it launches will be vital to help them do this. The CosTesGrav researchers are using observations of galaxies that are up to 3.3 billion light years (20 sextillion miles) away to look for tiny distortions in their shape caused by gravity. The general theory of relativity states that light is bent by gravity, meaning that it can leave a distinctive signature in the light emitted by distant astronomical objects like galaxies. The CosTesGrav team have already used images from the Hubble Space Telescope to look for some of these distortions and found that the signature left by gravity is consistent with general relativity. But Prof. Koyama believes that larger-scale surveys like those conducted by Euclid could allow them to detect distortions that indicate there may be something else at work. ‘We need to explain the success of general relativity on small scales but at the same time modify it over very large scales,’ said Prof. Koyama. ‘It is a challenge. We have two approaches – one is to come up with theoretical models and use state-of-the art simulations to test them. He says that combining these approaches will enable the researchers to capitalise on Euclid’s highly accurate maps of the distribution of galaxies and test general relativity on a cosmological scale. Their work could not only solve one of the biggest outstanding puzzles about the universe, but could also radically rewrite our understanding of our place within it. One leading alternative theory to dark energy suggests that space-time may have extra dimensions that are only possible to detect on the cosmological scale. A modification to general relativity, however, could have important implications here on Earth. Most of us use the theory every day when we follow directions on our mobile phones or in-car navigation systems. The data gathered by Euclid will also prove vital for scientists working on another project that is looking to not only test the general theory of relativity, but also shed light on some of the initial conditions that led to the current structure of the universe. The GrInflaGal project is using observations of massive galaxy clusters – vast, dense structures bound together by gravity in space formed of millions of galaxies – to examine the distribution of matter in the universe and the effects of gravity. ‘We want to model galaxy clustering on large scales, but to do this we need to know how these galaxies behave,’ said Dr Fabian Schmidt, a cosmologist at the Max Planck Institute for Astrophysics in Garching, Germany, who is leading the GrInflaGal project. By measuring how other objects around galaxy clusters behave – such as looking at differences in speed compared to their mass – the researchers believe they can measure the gravity of these enormous structures and so test whether they adhere to general relativity. This could then be used to help unravel how the universe went from being a hot, uniform clump of dense matter to one where galaxies are scattered in clusters seen today. ‘The goal is to have a nearly optimal way of testing gravity from upcoming surveys like Euclid,’ said Dr Schmidt. ‘We have no idea about how inflation in the early universe happened, but surveys like Euclid could improve the constraints we are using.